4. Pernell Whitaker: Any list involving the all-time best defensive fighters has to include “Sweet Pea,” whose array of dips, slips and dodges confounded an entire generation. At first his legs shouldered a fair share of the burden but once he mastered George Benton’s lessons of defending while “in the pocket” he brought his game to a level most fighters would never know. Even when less than two feet away hitting him was a frustrating chore and his slick counters enabled him to sweep scorecards like few others. Olympic career – As mentioned earlier, the Soviet-led boycott of the 1984 Los Angeles games, a retaliation for Jimmy Carter’s decision to not send a U.S. team to the 1980 Moscow Olympics, thinned the field. 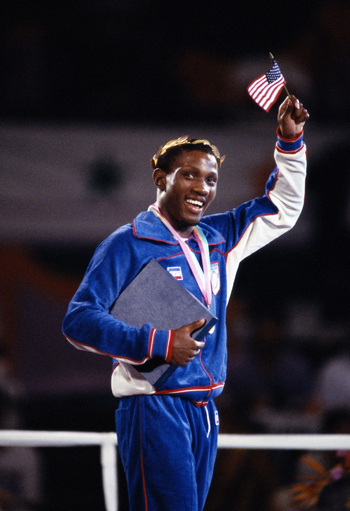 However, Whitaker was among the very best in the world as he beat two-time gold medalist Angel Herrera of Cuba four times, including at the final of the 1983 Pan Am Games. Whitaker began his Olympics with a 5-0 decision over Nicaragua’s Adolfo Mendez, then repeated the trick against Geoffrey Nyeko of Uganda, Reiner Gies of West Germany and South Korea’s Chil Sung Chun. The only fight that didn’t go the distance was the final, which saw the corner of Puerto Rico’s Luis Ortiz stop the fight after Ortiz took a standing eight count in round two. In five fights, Whitaker was like the best of the old-time college football teams – unbeaten, untied and unscored upon. Professional career – Whitaker’s talents continued to blossom and until his second-to-last fight against Felix Trinidad it could be argued that “Sweet Pete” (his original nickname; a sportswriter mistook the chant for “Sweet Pea,” which stuck) never legitimately lost a fight. He captured titles in four weight classes and when he uncharacteristically blasted out Juan Nazario in one round he became the first man since Roberto Duran 12 years earlier to become undisputed lightweight champion, a title which he retained three times before moving up to 140. Whitaker’s record in title fights was 19-3-1 (4) and his title-fight victims included Jose Luis Ramirez (avenging a horrifically bad decision), Greg Haugen, Freddie Pendleton, Azumah Nelson, Jorge Paez, Rafael Pineda, Jake Rodriguez, Buddy McGirt (twice), Julio Cesar Vazquez, Wilfredo Rivera (twice) and Diosbelys Hurtado. His list of non-title victories also stacks up nicely – Roger Mayweather, John Montes, Rafael Williams, Miguel Santana and Harold Brazier.